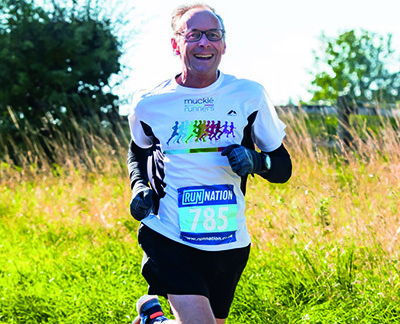 Hugh took up running as a hobby 10 years ago and already clocking up an impressive list of marathons and ultra-marathons on his journey so far, he has now been awarded one of ten exclusive national places made available by Advocate, which is the national charity finding free legal help from barristers. He has now earned the right to compete alongside13,000 other runners in the world famous half-marathon, which takes place on 24th March 2019 and also takes in renowned landmark places through both the City of London and City of Westminster. The race starts on Pall Mall and finishes by Downing Street and has fabulous views of London’s most iconic buildings including Big Ben, St Paul’s Cathedral, Nelson’s Column, the Gherkin, the Shard, the Tower of London and the London Eye and of course the Royal Courts of Justice in the Strand. Speaking about his news, Hugh said, “This is such a privilege for me to be accepted and be given the opportunity to run in the London Landmarks Half Marathon. I took up running 10 years ago and run for fun, so this is a great opportunity for me to combine my love of running with fundraising for a cause that I really care about. “I am passionate about equality and justice. For me, access to justice is every bit as important within our society as access to education and healthcare. It’s fundamentally wrong that people who can’t afford it are denied access to legal advice and to the court system. “Also like many other legal practices our lawyers at Muckle are very active in doing pro bono work and we see this as a key part of our commitment to this region. “I have been challenged to raise a minimum of £400 pounds in sponsorship money as part of my place in the half-marathon and this will be the first time I have asked friends, colleagues and clients to sponsor and help support my running.” he added. Advocate encourages and facilitates voluntary work by lawyers and others working in the legal sector in their local communities. “Last year Simon Gledhill of 3 Temple Gardens achieved a Guinness World Record for the fastest half marathon whilst wearing barrister robes. He’ll be running again in 2019, this time alongside Hugh to raise funds for our work. We have a well-established charity and fund raising programme and actively encourages staff to become involved. Over 40% of its staff regularly volunteer for charities and the firm donates 1% of its annual profits to its charitable fund each year. To date, many communities and worthy causes across the North East have benefitted from over £500,000 in grants from the fund. Hugh has led the business in developing its award winning corporate social responsibility programme. We’re a five-time winner of the North East Business Heart of the Community Award (Tyneside and Northumberland) and won national recognition when it scooped ‘Best Contribution by a Firm with a Regional Head Office’ at the 2017 Law Works Pro Bono Awards.